When people think of former Steelers head coach Bill Cowher‘s first season in Pittsburgh–1992–one of the first things that comes to mind is his initial game, a 29-24 come-from-behind victory over the Oilers at the old Astrodome in Houston. Yes, it was a great way to kick off a career that would certainly put The Chin in rarefied air is it pertained to Pittsburgh coaching legends–the decision to try a fake punt, down 14-0 early in the game was an indication to the old AFC Central Division that this Steelers team and this Steelers coach were here to win. And win the Steelers did in ’92, five of their first seven games, in fact, and were primed for a first place showdown with Houston, a rematch that would take place at Three Rivers Stadium on November 1, 1992. With the help of an old LA Times post-game article, we know the Oilers jumped out to a 6-0 first half lead thanks to two Al Del Greco field goals–one from 29 yards away and the other from 19 yards out. 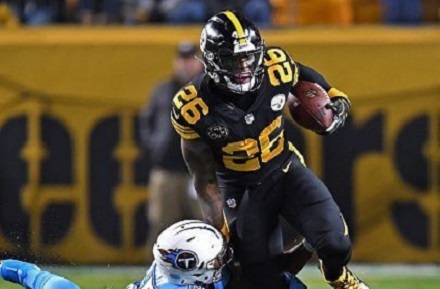 Pittsburgh took the lead later in first half on a one-yard run by Barry Foster, a running back who would go on to break the Steelers single-season rushing mark with 1,690 yards and tie an NFL record with 12 100-yard games. Behind 7-6 early in the third quarter, the Oilers lost their star quarterback and Steelers nemesis, Warren Moon, after Moon was hit on the chin by cornerback Rod Woodson. Speaking of nemeses, Cody Carlson, the unknown youngster who cost Pittsburgh a division title and playoff spot just two years earlier when he filled in for an injured Moon in the 1990 regular season finale and torched the Steelers defense for 60 minutes, entered the lineup and continued where he left off. Carlson connected with receiver Webster Slaughter for an 11-yard score to make it 13-7. That was bad enough, but just 1:03 later, Ray Childress scooped up a fumble by Steelers quarterback Neil O’Donnell and raced eight yards for yet another touchdown, stunning the Three Rivers crowd and giving Houston a 13-point advantage. But the Steelers were no strangers to overcoming such deficits against Houston in ’92: “We were down 20-7, but we’ve been there before,” Cowher would go on to say later. The Steelers were there before, and they were about to do that again. 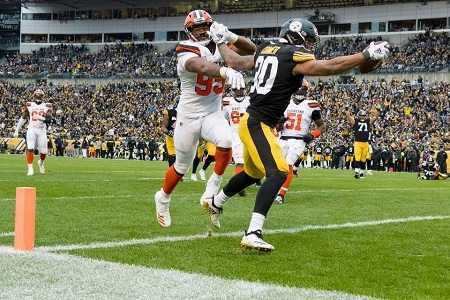 Early in the fourth quarter, Neil O’Donnell connected with tight end Adrian Cooper on a two-yard touchdown pass to pull Pittsburgh to within 20-14. Midway through the final period, following a fumble recovery by legendary linebacker Greg Lloyd, the Steelers went ahead, 21-20, on a five-yard touchdown pass from Neil O’Donnell to the other and more decorated tight end, Eric Green. It wasn’t over yet. The Oilers had one more chance. Cody Carlson had one more opportunity to stick a dagger in Pittsburgh’s heart–and if not end its season, at least capture sole possession of first place. As Carlson methodically drove the Oilers’ offense down the turf at Three Rivers Stadium in the final moments, I could sense another heartbreaking loss coming on the horizon. As the seconds ticked off the clock, and Cowher kept the Steelers final timeout in his back pocket, I figured a turnover was all that could save the day. And when Cody Carlson set up Del Greco at the 22 with seconds left, I kind of resigned myself to second place in the Central. 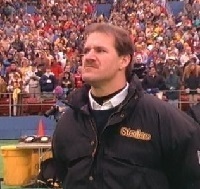 Bill Cowher’s instincts were on the mark. The day was actually saved by Del Greco, himself, who hooked the seemingly make-able field goal, giving the Steelers not only sole possession of first place, but an all-important sweep of Houston. As the fans in attendance went nuts, some of whom were seen dancing and hugging on the top of the dugout, I felt the kind of magic that fans must have experienced two-decades earlier, when the 1972 edition came out of nowhere and captured the hearts of an entire region (for good). The 1992 Steelers had put the rest of the NFL on notice. What is it like to witness the end of one era and the beginning of another? Every journalist dreams of the opportunity. Fate afforded the Pittsburgh Post-Gazette’s Ed Bouchette the chance to do just that in 1992 when Pittsburgh Steelers transitioned from Chuck Noll to Bill Cowher. The devastating 1992 pressman and drivers’ strike that shut down the Pittsburgh Press and Post-Gazette left Ed Bouchette without a paper to print his stories. Fortunately, the Post-Gazette kept Ed Bouchette employed as part of their skeleton staff, and Sagamore Publishing approached him about chronicling both the end of Chuck Noll’s tenure and the beginning of Bill Cowher’s. The result was Dawn of a New Steel Age, a 214 page volume published in 1993. Bill Cowher on the cover of Ed Bouchett’s Dawn of a New Steel Age. Then there are the iconic books, ones that serve as a touchstone for their respective generations. Think Roy Blount’s Three Bricks Shy of a Load. Truthfully, people don’t discuss Dawn of a New Steel Age in such reverential tones as they do with Three Bricks. Perhaps they should, because Bouchette’s book really is that good. I remember reading Steelers Digest’s profile of Dawn in 1993, but in those pre-Amazon days getting a copy outside of Pittsburgh was hard. However, I spied a copy at Station Square just before the Steeler ’96 home game against the Bengals, and it has served as a reference book ever since. Bouchette divides his book neatly into 20 chapters, seamlessly weaving a tale where each chapter tells an independent story that contributes its unique elements to a unified narrative. One critique of journalistic prose is that it too often sacrifices historical context for immediacy In contrast, too many history books offer dry recitations of fact that fail to convey a sense of present, or the flavor of the moments they’re recounting. Bouchette’s Dawn of a New Steel Age does the opposite. A reader who picks up the book today can follow the progression of the 1992 Steelers and gain what it was like to experience the birth of Cowher Power as it happened, while understanding just how those moments fit into the context of Steelers history. That’s a more difficult feat that it may seem. Jim O’Brien’s books on the Steelers deliver excellent insights, yet they often read like collections of individual stories that don’t from a central narrative. Read today, Bouchette’s approach provides a refreshing contrast to our Twitterized communication landscape. 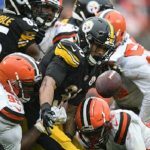 Another writer charged with telling the same tale could have easy fallen back on “The game passed Noll by and Bill Cowher offered a breath of fresh air.” But Bouchette doesn’t do that, and because of that the Dawn of a New Steel Age succeeds in making unique contributions to Steelers history. 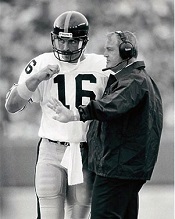 Chuck Noll and Mark Malone. Why DID the Steelers slip into mediocrity in the 1980s? Poor drafting is the answer, but Dawn of a New Steel Age delivers insights into WHY the Steelers drafting slipped so badly. Art Rooney Jr. touched on this a bit in his book Ruanaidh, as did Michael MacCambridge and Gary Pomerantz. Bouchette arrived sooner, however, and in many ways still tells a more complete story than those who follow. While a Dawn of a New Steel Age offers the appropriate deference to what Noll accomplished with limited talent in the 1980’s, one thing stands out: the implicit criticisms made of Noll that many of Bouchette’s subjects offer. And that’s another strength of the book. The breadth and depth Bouchette’s interviews are unparalleled. Bouchette managed to talk to the ball boys to lesser known Rooney brothers and everyone in between. As the title suggests, Dawn of a New Steel Age doesn’t focus on the 80’s, but rather on the birth of the Cowher-era. 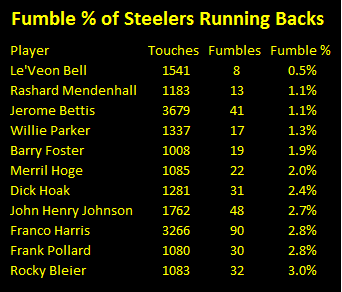 And the insights Bouchette delivers on the 1992 Steelers are just as rich as his reflections on the 80’s. To that end, Bouchette devotes full chapters to the 1992’s key actors: Rod Woodson, Greg Lloyd, Hardy Nickerson, Neil O’Donnell, and Barry Foster. Bouchette also offers one of the first profiles of Art Rooney II. Art Rooney II is now of course the face of the Rooney family, a role he’s occupied since Dan Rooney left to serve as ambassador to Ireland in 2009. But in 1992 Art Rooney II had only recently assumed the title of Vice President of the Steelers and still maintained an active law practice. Bill Cowher is of course the protagonist in a Dawn of a New Steel Age. And Cowher’s presence and influence on the momentous events of the Steelers 1992 season are evident on every page of Bouchette’s book. Bouchette quotes Cowher liberally, and fans who remember the rest of the 90’s or the 00’s will find a more affable Cowher in the pages of Dawn. In his autobiography Dan Rooney observed hiring a new coach almost forces a franchise to start from zero. He would know. Dan Rooney watched in agony has as Art Rooney Sr. cycled through 11 head coaches while failing to win a playoff game in 4 decades. Dan followed by winning 6 Super Bowls with 3 coaches in 4 decades. Bill Cowher may not have reset the franchise to zero, but he did author a new era for Steelers football. A Dawn of a New Steel Age captures that process in real time. 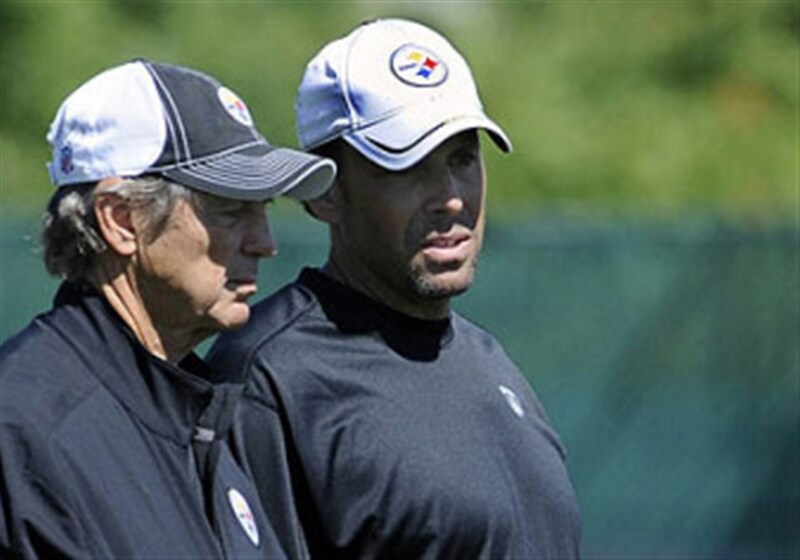 Bill Cowher’s arrival spurred changes from top to bottom in the Steelers organization, including their approach to the draft, the way they practiced, even how players conditioned. Bouchette documents it all. That’s an accurate self-assessment, but perhaps one that does not go quite far enough. After the 1992 Steelers upset road win over the Kansas City Chiefs, Steelers Digest editor Bob Labriola declared, “Something special is happening to this team and this city.” He was right. 1992 was a special time to be a Steelers fan. 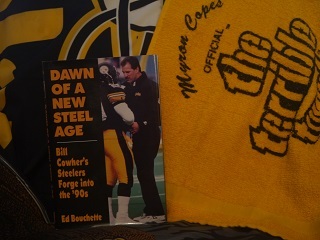 Dawn of a New Steel Age is a special book because its pages capture and preserve the energy that awoke Steelers Nation in 1992 for all who read it. Editor’s note, as of this posting, copies of Dawn of a New Steel Age appear to be available on Amazon. Taken from the grade book of a teacher who is simultaneously inspired and worried at his class’ performance with the star pupil absent, here is the Pittsburgh Steelers Report Card for the AFC North Clinching win over the Baltimore Ravens at Heinz Field. 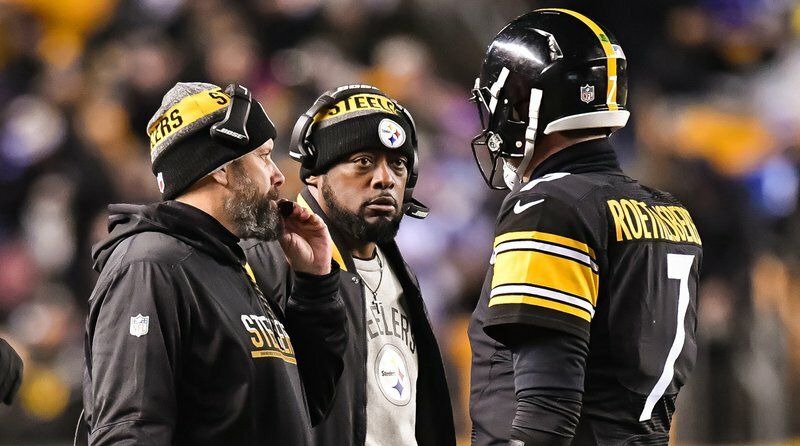 Tomlin: You guys wondered why you hadn't seen Martavis Bryant return kickioffs before — "now you know"
Then there was the issue of the Steelers kick coverage team that was having a solid night until it allowed Michael Campanaro to return a kick 40 yards after the Steelers had just pulled within 2, which set up the Raven’s final touchdown. 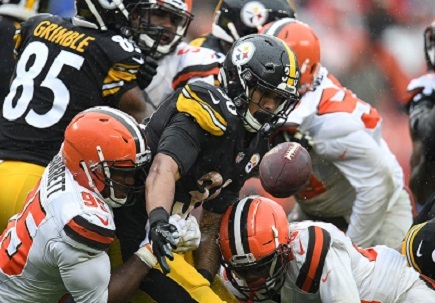 Devising a game plan to replace your best player on defense on the heels of a Monday Night game no less, isn’t easy, but that’s the task that fell on Keith Butler this week. To be sure, there were errors execution, sloppy tackling and some inanely stupid penalties that no scheme or amount of chalkboard planning could have compensated for. But if the Steelers ARE clearly struggling to replace Ryan Shazier in the middle of the field, the defense did stop the Ravens cold on 3 of four 4th quarter series. That at least lends some hope that Steelers coaches find something that worked schematically during tape review. The Steelers offense offers a more interesting tale. 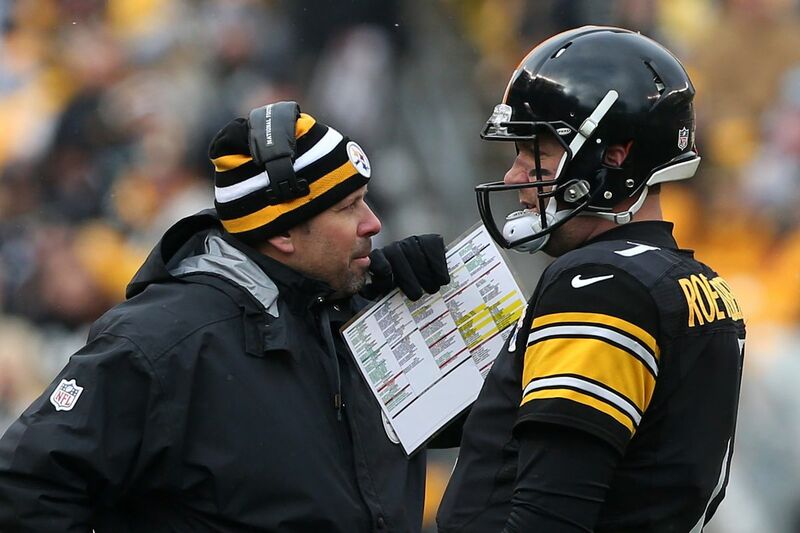 Todd Haley’s offense had an excellent first quarter, a solid second quarter only to disappear in the third quarter. The fourth quarter performance of the Steelers offense against the Ravens is nothing short of watching a legend in the making. 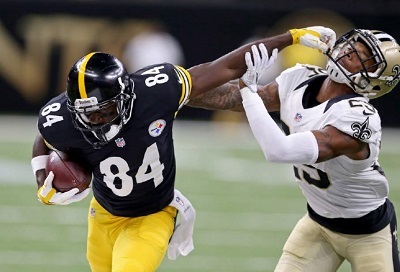 On a night when Antonio Brown performed like an incarnate angel and a massed over 200 yards receiving the stat line of 14 for 149 went almost unnoticed. It shouldn’t. As 12 of those 14 catches came on scoring drives, and the Steelers needed everyone one of them on this might. Those stats didn’t come from one player, but rather a duo. 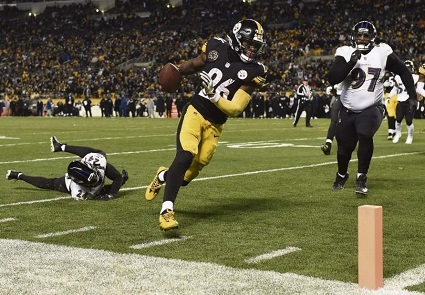 Tomorrow morning Tony Defeo will sing their praises here, but for now we’ll simply recognize the efforts of Jesse James and Vance McDonald as the Unsung Heroes of the Steelers AFC North Clinching win over the Ravens.